The Washington Redskins may just have found the answer to their long-standing safety problem. According to NFL Insider Ian Rapoport, the team has inked former New York Giants safety Landon Collins to a six-year megadeal that’s reportedly worth around $45 million in guaranteed money, money which will be paid out throughout Collins’ first three years in the Nation’s capital. The move goes a long way to fixing a problem that has been evident for a long time now. Since 2006, when PFF started grading games, 33 different safeties have manned the safety position for Washington, yet Sean Taylor (84.9, 2007) and LaRon Landry (80.6, 2008) are the only two who finished with a single-season grade above 80.0. Even D.J. Swearinger, who seemed like the answer at the position until his dismissal that came late in the season, left the team with a grade of 79.8 which, even though it was below the 80.0 mark, was the highest single-season grade by a Redskins safety in over a decade. Collins has more than proved his worth in the NFL and can be an impactful contributor if healthy. He had a slow start, but his overall grades of 82.4 and 82.3 in 2016 and 2017 (10th and 12th among safeties, respectively), prove that he has the ability to strengthen the back end of Washington’s defense, and maybe even take it to a place that fans haven’t seen before. After all, Collins’ 2018 overall grade, his worst since his rookie year, is still good enough to be the 12th-best single-season mark ever recorded by a Redskins safety. 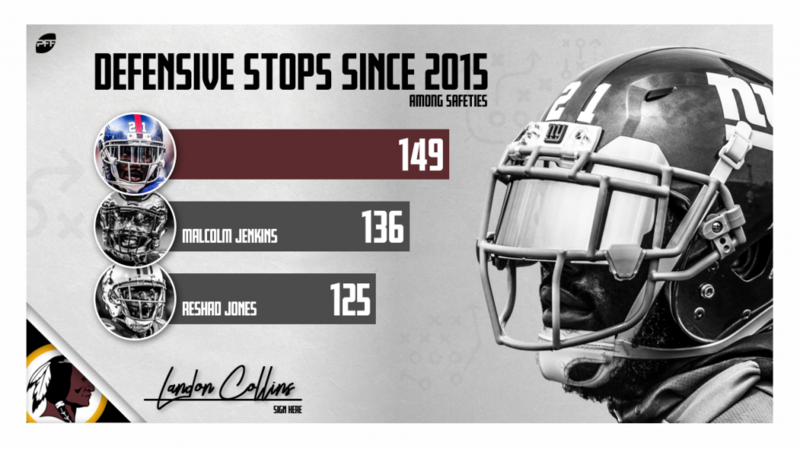 The slot coverage ability of Collins will help a Redskins defense no end, as it’s been a notable area of need since they lost promising young corner Kendall Fuller as a part of the team’s trade from Alex Smith. In 2018, Collins earned a coverage grade of 77.9 when he was asked to guard the slot — 15th among the 51 safeties with at least 50 coverage snaps — while his 1.47 yards allowed per coverage snap fell just shy of Swearinger’s mark of 1.46. Over the last three-years, Collins has allowed a passer rating of just 85.4, and he’s tallied a forced incompletion percentage of 11.4% when he’s been asked to guard the slot, which are good for 12th and tenth, respectively, among the 41 qualifying safeties in that three-year span. While this may seem like a lot of money on paper, the team should be praised for securing the signature of one of the best at the position. Collins, the perfect, modern-day solution to a problem that has been going on for too long in Washington, now has the chance to go out and prove his worth.